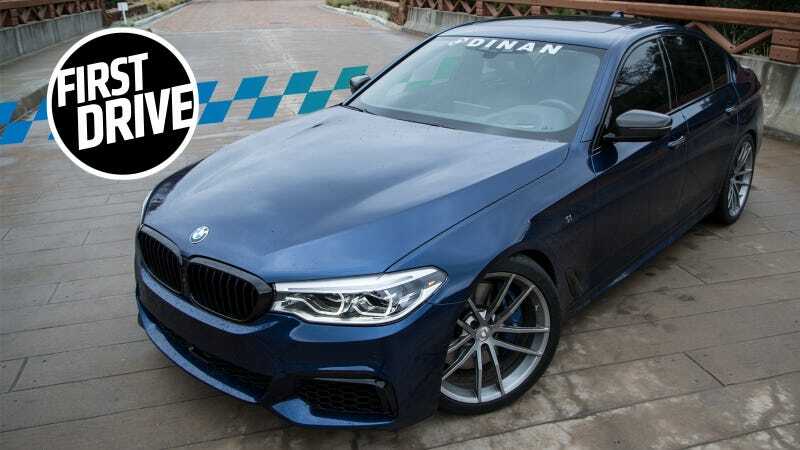 I was about to call this $98,000 2018 BMW M550i with Dinan’s Stage 1 tune a “sleeper”, but the quartet of fatty exhaust pipes and 20-inch Forgeline wheels will definitely wake you up. It’s a lot more low key than an M5, though, and on the highway it’s pretty much a low-flying private jet. The current BMW 5 Series, the seventh-generation car known internally as the G30, comes in many flavors. You can get the humble four-cylinder 530i, or the 600 horsepower M5 that can have you blazing out of your office parking garage and on to 60 mph in under 3.5 seconds. The legendary M car is loud, brash and heavily bolstered for hard driving. It’s the most expensive 5 Series, and ergo, as popular among people who need their BMW to advertise disposable income as much as those who actually like to drive. For someone who wants an engaging driving experience with less flash and aggression, the 2018 M550i xDrive is quietly an impressive and comfortable car. The M550i is about 150 HP shy of the M5 and certainly can’t keep up on a closed race track, but for street driving, it’s plenty. Then again, what if you introduced a little more secret overkill into the M550i’s equation, by taking it up to the M5’s power level while keeping the design and interior focused on comfort? For BMW fans with that very specific vision, Dinan’s parts catalog can create a pretty nicely organized M550i S1 like this one. Normally the M550i’s 4.4-liter twin turbo V8 is rated to 456 HP and 480 lb-ft of torque. Its eight-speed automatic sends power to the front and rear wheels as the car’s computer traction control systems see fit, and in ideal conditions BMW claims the car can do zero to 60 in just a hair under four seconds. The car lists at about $74,000. That’s all before Dinan’s people get their hands on it. This particular M550i has a performance computer tune that basically cashes in fuel economy for performance. Dinan promises it’s legal in all 50 states. Combined with the company’s free flow stainless steel exhaust system and high-flow mid-pipe the car moves up from its stock output to 606 HP and 634 lb-ft of torque which Dinan’s build sheet claims translates to 488 HP and 523 lb-ft at the wheels. 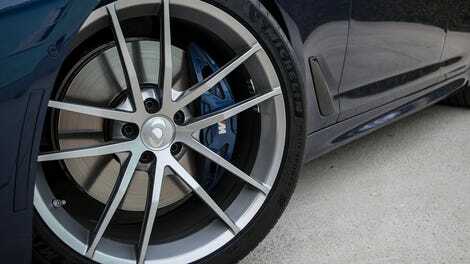 Those wheels here are 20-inch Forgeline AR1 blades wearing Pilot Sport 4S tires. Ride quality and suspension responsiveness is enhanced with new springs and a “handling kit” which includes progressive rate bump stops and precision ball joints that replace rubber bushings with machined aluminum. All that plus the decorative carbon fiber pieces you see in these pictures adds up to about $14,000, and that combined with this M550i’s factory options like the most advanced parking camera I’ve ever seen bring the total price as tested to just over $98,000. I couldn’t blame you for assuming this car sounds obnoxious, with its exhaust tips protruding outward like a row of cannons on a battleship. But the note is actually refined, relaxed and surprisingly quiet. You can still hear the whoosh of the turbo when you move to merge, so even under load the car maintains a fairly mature tone. Those merging moments are really where the thing shines brightest, too. Taking this car from about 25 mph to three times that is as satisfying as it is efficient. A cascade of power pours from the engine through your heart and out onto the road behind you in a series of snappy shifts to cruising speed. If you had enough room to gallop, I have no doubt that this car could comfortably eat Autobahn miles at 150 mph for hours without tiring you out. The steering wheel feels as fat as an elephant’s trunk, which I generally like in a car this size, and the seats do a nice job of keeping you from sliding around when you start heating up the tires. But as far as the aftermarket parts on this particular one, the combination of the power upgrade and handling tweaks was definitely cohesive and seemed seamlessly integrated into the car. There was no awkward abruptness in the suspension over rough roads-something that can happen when a car gets lowered-and the engine and transmission were working in perfect harmony even with the added 150-odd crank horsepower. The M550i is over 195 inches long and 4,372 pounds. High quality tires and Dinan’s handling upgrades make it responsive for a car its size, but in Malibu’s tight canyon roads, on a misty Sunday morning, I can’t say the thing was exactly egging me on to chase its traction limits. I’m sure a stunt driver or racer could find the edge of the car’s abilities more easily than I can, but one thing nobody behind the wheel of this M550i could deny: the car feels heavy. And since there was no way I was about to disengage traction control on a wet road, I can’t say I felt a lot of... spirit... in my spirited driving through twists. The vehicle’s responsive but it’s hard to feel where the front wheels are pointing through that fat helm. This was also the first time I’ve driven a true performance machine with an HUD, and I have to say I found it a lot more distracting and annoying than useful. The rest of the car’s tech let me down as soon as the rain got heavy, too. A cascade of error messages came through the infotainment system warning me about various crash sensors and mitigators failing. These, by the way, were all triggered without me hitting anything or anyone. Smooth cruising, spaceship acceleration, and just a small splash of aesthetic flair to make you look back and smile after you park—forget the track day shenanigans, this is what a true sport sedan is supposed to be about. After all, you could track this, or the new M5, but why would you want to? There are so many smaller, lighter cars that will do the job better. Everyday enjoyment is where this Dinan 5 works best. Loads of pulling power but plenty heavy, too. We’re realists at Jalopnik. And a realist has to ask if you’d rather have a stock M550i and used rear-drive manual shift thrasher car, or this 5 Series with about $25,000 in upgrades. If you asked me that, I’d have to opt for the two-car solution. You could do a lot worse than a big, beautiful BMW with 150 HP of extra boost, though. And driving this every day would let you enjoy a lot of car all the time.